What are the major objectives of the HLS project? We are trying to create a seamless data set of surface reflectance observations combining data from the US Landsat system and the ESA Sentinel-2 system. These satellites fly instruments that are similar, but not identical. To make it easier for users to combine the time series from both instruments, we are performing radiometric and geometric corrections to both data sets to make them as “identical” as possible. By doing this, we can provide observations at 30-meter resolution every 2-3 days over the entire globe. What are some example applications that would benefit from the dense optical time series that the HLS data set offers? Any application looking that very dynamic phenomena, where changes occur on the timescales of a few days or weeks. For example, crop condition and area, burned area, or surface water extent. Also, any application where short-term environmental conditions (like drought) have a rapid impact on ecosystems. Are any groups operationally using HLS data? Not truly operational, but Dr. Patrick Griffiths of Humboldt University used HLS to create the first crop type map for Germany. Other groups are using HLS to understand phenology (seasonality) of forests, and to map effects of herbicide on agricultural productivity. What have been the biggest challenges to overcome in order to create the HLS data set? 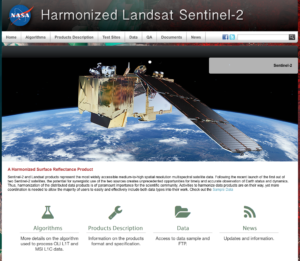 Both Landsat and Sentinel-2 are excellent imaging systems, but it has been difficult to keep pace with changes in data formats and data processing versions. Particularly with Sentinel-2, the first couple of years saw substantial changes in instrument calibration and data formats. We also had to deal with the fact that the two data sets are not inherently co-registered geographically – that required a fair bit of analysis to figure out how to come up with a common geographic reference. 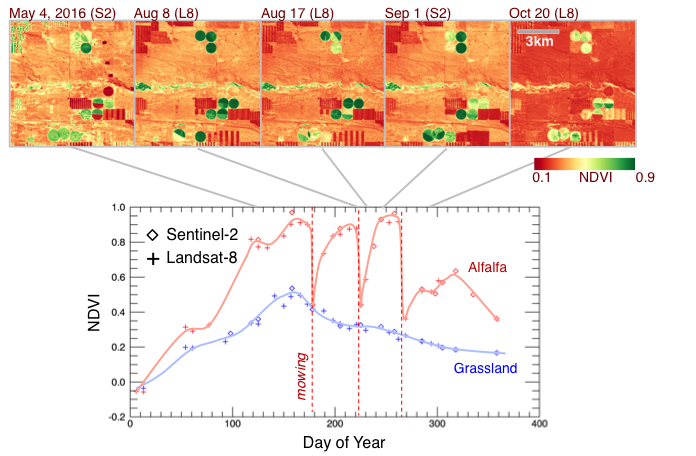 Seasonal phenology (greening) for natural grassland (blue line) and irrigated alfalfa fields (red line) near Cheyenne Wyoming observed from Harmonized Landsat/Sentinel-2 data products. The high temporal density of observations allows individual mowing events to be detected within alfalfa fields. HLS Products available from https://hls.gsfc.nasa.gov Image credit: Masek et al. This entry is filed under Data, HLS, News, Q&A.